One of my favorite things about coming home is looking through my old bedroom. It seems every time I find some Backstreet Boys poster/Claire's bracelet/witchcraft book from my past to remind me of how embarrassing I used to be-and this time is no different. 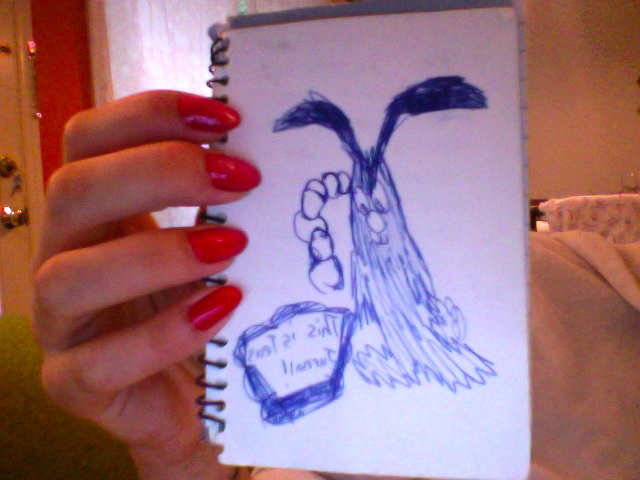 Welcome to Tea's First Diary [/look at my nails]. I am ten years old and obsessed with Pickebicke, a mute cartoon rat with a sweating problem. With him I discuss pressing issues like D.A.R.E homework, sleepovers and my first Real Boy Crush (I say "Real Boy" crush because my first crush was actually on Walt Disney's Robin Hood but I don't think that counts because 1) he is a cartoon and 2) he is an animal). 1) My handwriting was better pre-internet. 2) I apologize too much. 3) If anyone thinks I'm "boy crazy" now, they should have met me 13 years ago. 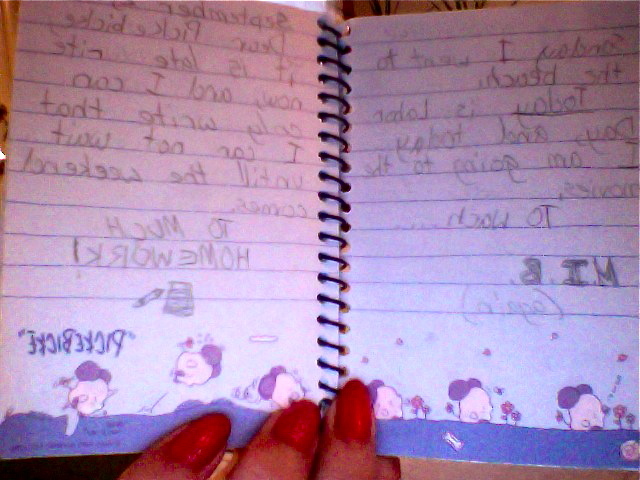 "Dear Pickebicke today is Friday, August 29, 1997. I am at aftershool, and I am waiting for my mom to pick me up, because today I am having a sleep over. Naomi and Linda, are just playing at my house, but Amy, and Jennifer are playing and sleeping over. Over the summer, my mom and dad got me a t.v. in my room. That means I will rent a movie, and so we will watch a movie in my room." (I always remembered being a popular kid and now I realize it's only because I had a place to watch Spice World). 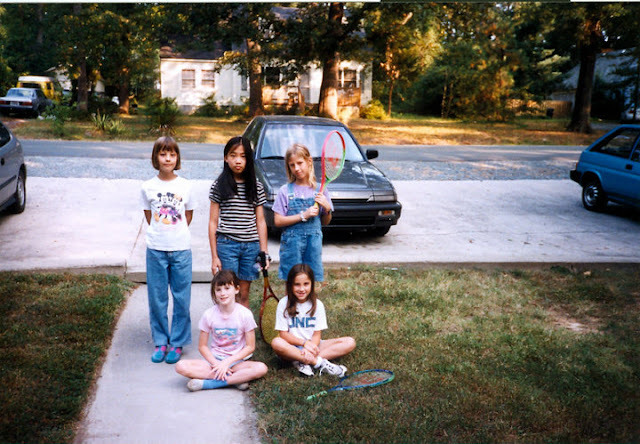 (For reference: Left-Right Top: Me, Linda, Naomi; Left-Right Bottom: Jennifer, Amy). "Dear Journal I am sorry that I did not write on saterday, and sonday. But I can write that on saterday I had a sleepover at one of my friend's house, and that on sonday I went to the beach. Today is Labor Day, and today I am going to the movies. To watch....M.I.B. (again)"
(Jeez another sleepover? The Beach?! Who do I think I am, Britney Spears? Oh, yeah and I'm totally obsessed with Men in Black/Will Smith, probably why soon after this I lose my 2nd Base Virginity to a black boy). "I am so sorry that I didn't write yesterday. But I can tell you that the party went good and that I saw Yoaff. He got a haircut!!!! Today nothing happened so this is all I am going to write. I love Yoaff." (Who am I apologizing to? The secret audience of boys following me around/reading my stuff/watching me sleep, that's who! (Not kidding). Also, another party? 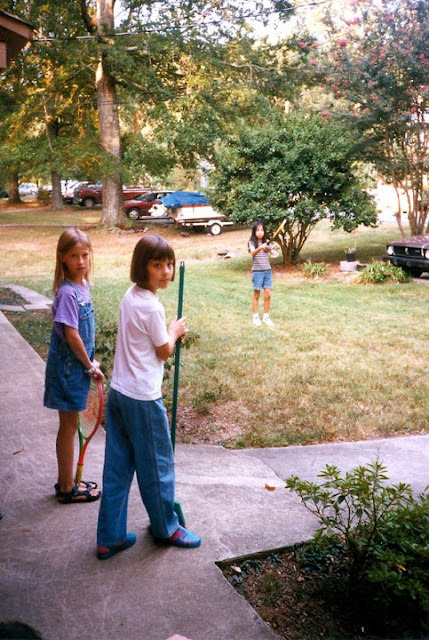 Oh, and this is when I start talking about "Yoaff," a boy with a shiny bowl cut my friend Linda and I eventually go psycho for). "Linda is my best friend. She is so funny. From Tea." "Nothing happened today but I have alote of homework. Yoaff did not come today. :( :( I spelled his name wrong, it's Ioav. I think that's a weird way to spell it." (Funny because I obvs know I lot about spelling). "Today I have D.A.R.E homework it is very easy! I miss Ioav!!! I hope he comes!! Yesterday Linda told Ms. Singletery that we like him! But I don't care. Today I watched a movie at afterschool. I thought Ioav would come but he did not!" (The thought of Lil Me doing D.A.R.E homework not realizing I'll end up like the girls in whatever video I had watched earlier that day to scare me away from whatever I'll probably base my entire career on is a bit heart-wrenching, but LOL at me hoping a GUY comes! If only I had known)! "I feel so sorry for Linda because she asked the friend of Ioav to get Ioav." (This is Linda's handwriting again. She's obviously going insane). "I'm so sorry I did not write for a long time, but I was sick and I have a viress. Linda called me on Monday, but I could not get out of bed. I was so sick. I think Linda called me to ask why I was not at school or she might have seen Ioav and just wanted to tell me how stupid I was for not going to school. I kinda wish he did come so that Linda could see him and I kinda wish he did not come so that I would miss out on seeing him." (Here I'm lying to myself-there is NO part of me that wishes Ioav came when I wasn't there-duh! Linda doesn't deserve him, he is obviously in love with me). "It is Thursday and I am still sick! The day befor yesterday I had a dream that Linda was in my class. When we went into the cafetiria for lunch a teacher told us that a stage was built and that some boys wanted to sing. One of them was Ioav! And the rest were his friends. Befor they sung I saw that Ioav was looking at me and/or Linda! After they sung they went to mine and Linda's class. (Remember we had the same class in my dream) And they kept on looking at me in the room. Then I woke up. Then last night I dreamed the same thing but that Ioav did not come and he never came back again." (LOL at "me and/or Linda"-I'm obviously afraid that she is reading this. Also I had the same dream recently only Ioav was Nicki Minaj and her friends were Berlusconi's Women). "Today me and Linda made up a poem about the day that Ioav came and talked to us: The sky was blue, the trees were green, and he was sweeter than anything." (Almost over yall, I promise). "Yesterday Amy's mom checked us out of afterschool, but we could still play on the playground. So we went down the place that Ioav always came out of but we did not see him!" 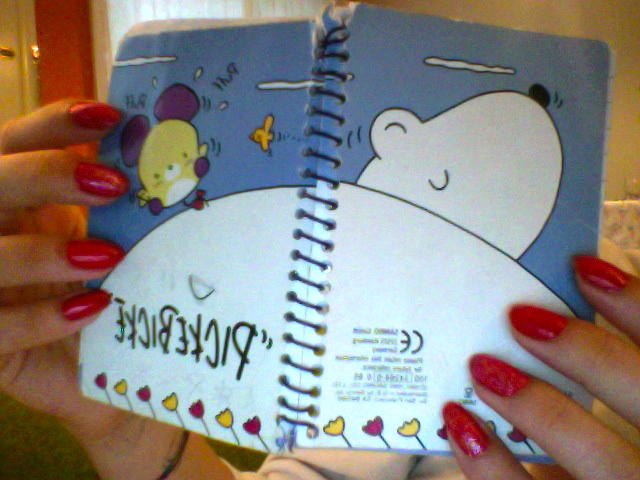 After this I get a bigger diary-with a lock-which I can't seem to find. I'd like to say it holds all the juicy details of my upcoming affair with Ioav (or my discovery of spelling and grammar) but I can't. I can tell you, however, that I haven't changed much since then-I still hate homework, love sleepovers and am BFFS with Linda. The only difference is I've learned how to be less passive in my Stalking. Speaking of which, I managed to find Ioav on Facebook and asked him for his friendship. If he accepts, I'll ask him out on a date-I'll write whatever happens to Pickebicke-and hope Linda doesn't get jealous. Trixy has died last night. She was our dogs biggest enemy. They loved to bark at each other. My black cat loved it. She was running after my truck every day when I was coming from work. And she was loving to be pet from me. We gonna miss her. But I know, if there is one, she is in Heaven. Because all dogs go to Heaven. Robin Hood WAS pretty foxy.